The pewag levo hook LH stands for a new generation of lifting devices. Thanks to its high-performance features, lifting and lowering loads is now easier than ever before. 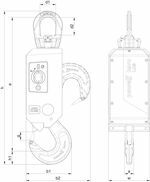 In day-to-day operations, attaching the hook manually becomes effortless, with a magnetic module attracting ferrous lifting devices and positioning them in such a way that the battery-powered, rotatable lifting hook will get perfect grip. The entire workflow is performed via a radio control unit. The automation enables safe work even in high altitude and dangerous situations. This is how the pewag levo hook LH becomes a problem solver for people and load.